Forstaag the Sweltering is a Nord barbarian who can be found in Plaza Brindisi Dorom. If you talk to him and ask about his nearly naked state, he will insist that it was not a witch that did this to him, stating that it is just simply too hot to wear clothes. He wields an admantium axe and carries four quality restore health potions and 150 drakes. Aside from his natural resistance to shock, immunity to frost, ability to shield himself, and a natural frost damage spell, he knows no spells. 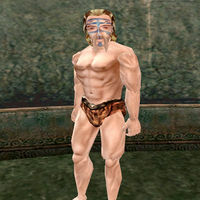 Forstaag is a reference to the three nearly naked Nords found in Morrowind (Botrir, Hisin Deep-Raed, and Hlormar Wine-Sot). This page was last modified on 15 November 2018, at 19:14.